My personal health issues, combined with frustration with lack of results using the current common answers, continually take me to new and interesting places. In the past year most of what I know about metabolism, nutrition, and now feet (and foot pain) has shifted drastically. It all comes back to evolution. I’ve had intermittent stabbing pain for about 7 years, focused at the 1st MP joint (where the big toe joins the foot). I walk a lot, and the more I walked, the more it hurt. It had been diagnosed as a stress fracture years ago, and and for years I would wear Danskos* (hard soles, so my feet didn’t flex) when the pain got bad. Basically the Danskos acted as a walking boot. I am heavy (180lbs, due to muscle and bone from my bodybuilding days, plus all the extra padding I’m currently carrying) and have small feet and a stompy gait… It just refused to heal. The foot pain had been interfering with my workouts, but it was getting worse and now messing with my weekend fun, too … that’s no good! So I started investigating and it turns out the solution was simple. I didn’t have a stress fracture at all. Wearing tight shoes, especially heels, can cause bunions (angled big toe), neuromas, and hammertoes (bent toes), too. Fortunately my problem was easier to fix than the poor feet in this stock photo! I had to change my shoes. That wasn’t all of it, of course – I also needed some fascial adhesions stripped out. Acupuncture reduced the pain and swelling, and the minimal shoes I transitioned into have had the cool side-effect of forcing me to soften my gait. I wear CorrectToes spacers when I remember. Still, changing the shoes was key . Shopping guide here. Rolfer Karin Edwards-Wagner does a lot of work with feet, and she pointed me towards the brilliant Dr. Ray McClanahan. He’s got a bunch of videos and articles on his site, so rather than reinventing the wheel I’ll just let you look at his stuff. Here’s the deal: See those bones on the top of your foot? Your toes should extend in a straight line from them. For centuries we have crammed our feet into shoes that gathered the toes together, creating a sleeker pointed look instead of the spread “duck-foot” that nature intended. Available here in the office, Correct Toes spacers help separate and flatten your toes into a natural spread for better stability. Use them along with changing your shoes, and getting some acupuncture and medical massage to break up fascial adhesions and relax the muscles of your feet. Your knees, hips, and even lower back will be happier once your gait is correct! Under your big toes are tiny floating bones called sesamoid bones, which provide leverage and assist in tracking as a tendon moves over bone. The knee cap is a sesamoid, too – in fact you can imagine a miniature knee cap under that joint in your foot. The bones have grooves that the sesamoids are supposed to follow. If the toe angles inwards, the bone is pulled off track. Ouch! 1) Have flexible soles across the ball of the foot and also longitudinally, for twisting. 2) Have the heel at the same level as the toe. Now that I’m used to “zero-drop” shoes, even a half-inch heel feels weird. 3) Fit well in the heel and instep, but have lots of room in the toebox. This is why regular “wide” shoes don’t work for me – the rest of my foot isn’t wide. See the pic below. 4) Don’t have a lot of “toe spring” – that’s when the toe of the shoe comes up off the ground. It pushes you into an unnatural position all the time. When buying shoes, remember to check for fit with the shoe liner test. Take out the inserts and stand on them (with all of your weight). If your toes drip off the edge, they are too small. Standing on the bottoms of the soles of shoes is another good way to assess how much room you’ll have. If your favorite shoes are just a smidge too tight in the toe box, you can remove the inserts, which gives you a few more millimeters of room to stretch out. If they are lace-up shoes, skipping the first set of holes can also let the toe box open up. The sad truth is that most of the anatomically correct footwear out there is hideous, but I have found some cute options! Shopping info here. 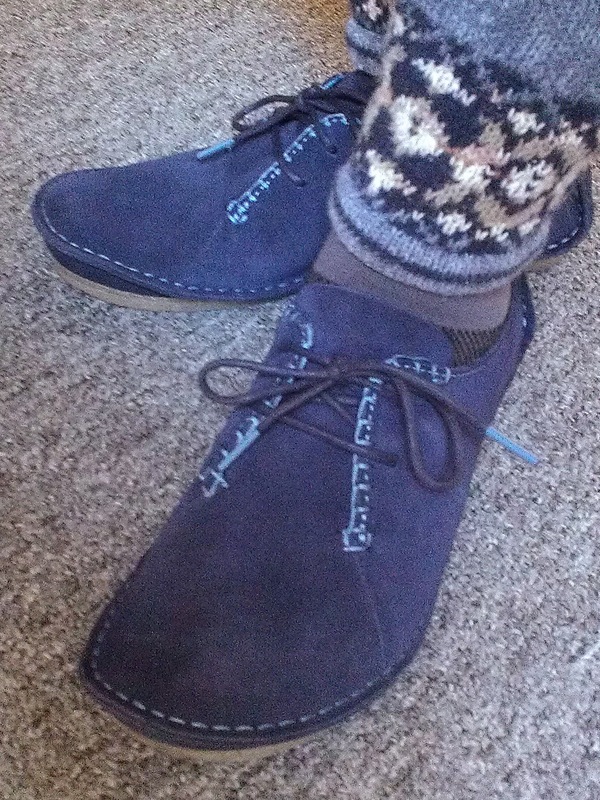 My winter boot review is here. In addition to going shoe shopping, I also got some socks! The regular “mitten” sock can encourage toes to gather together, especially if they get pulled tight as you slip into your shoe. When I wear those, I stretch out the toe seam to give myself some room. Sock Dreams is a fun local company that carries a variety of toe socks, and they ship for free. Can’t give up the heels due to work or your fashionista status? Check out this article on ways to mitigate the effects of high heels. So… the real question is, did it work? My emphatic answer is YES! A week after switching, for the first time I finished a LARPing weekend without being in agony. My foot and knee may have grumbled a few times (I run for miles during these weekends) but that searing pain was gone. At the end, instead of waiting miserably for Robert to be done cleaning, I was out doing extra trash sweeps, because I felt that good! Plus, at my next workout, I had to ask Brandie to throw extra weights on for the leg extensions and squat press, because the weight we were doing before suddenly felt ridiculously easy. Correcting my foot function helped my knee normalize, too, which is a bonus I hadn’t expected. It makes sense, though. If the toes can spread out and do their job creating stability, it takes a lot of pressure off the knees. The next adventure is the perfect intersection of SCA / LARP / craftiness, and healthcare: I’m going to try making my own shoes! Wearing softer, more flexible shoes that allow / force my feet to get to work makes them stronger. Here’s a cool exercise you can do to strengthen your arch. I still prefer some shock absorption when walking on man-made surfaces like concrete, but for dirt and carpet I like to go more minimal. More exercises! And even more! What about arch support? Modern shoes actually give us TOO much support, so our foot and leg muscles don’t work, and get weak. Remember we evolved without shoes. Our feet are designed to support us, given the chance. By doing foot exercises and gradually transitioning to more minimal shoes, your arch will support itself. This is awesome because it means your feet take a lot of the load back from the ankles, knees, and hips in terms of balancing. The whole body works better when strong and supple. Now that I have spent some time opening my feet up, I love the thin toe-separated shoes like Vibram 5 fingers. Just ease into them… minimal footwear takes some transition if your feet have been over-supported in regular shoes. I have a pair of Filas that are similar (just have shorter toes, so they fit me better) and I adore them! They are phenomenal for running around in the woods. EDIT 7/1/13: Here’s an awesome article on another reason to wear good shoes – neurological challenge! Also – I get asked about foot pain due to Morton’s neuromas and plantar fasciitis (inflamed fascia) a lot. YES, I can treat them! The good news is that the treatment is immediately and highly effective. The bad news is that it’s the only treatment I do that hurts… Sorry. But only briefly, and it’s worth it, speaking personally!